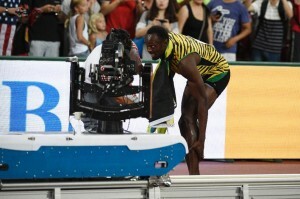 The Jamaican sprint star is forced to slow down his run: His Majesty Usain Bolt, in fact, was victim of an injury which will not allow him to keep up with the trainings. The French newspaper L’Equipe revealed it, stating though, that this is not a stop which might compromise his preparation towards the Olympic event in Rio: Bolt suffered a twist at the left ankle which will not allow him to run for about two weeks. Nothing serious for the sprint star who astonished everyone at the recent Beijing World Championships, where he managed to beat the Justin Gatlin with a performance at the level of his fame. The decision to stop to avoid making the situation worse seems more than correct, especially with an eye to the Olympic “triple”. “I have a great coach who knows how to be positive in all circumstances”- Bolt stated- “I have to say that I lived situations worse than this” ; the small injury seems not to bother him too much and the Jamaican star seems more motivated than ever. We will see him competing at the Olympics looking for the most precious medal in all the three races he will attend. After what happened in Beijing, nothing is impossible.